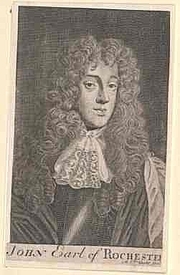 John Wilmot, 2nd Earl of Rochester, was famous at the 17th century English court for his drunkenness, witty conversation, and extravagant behavior as part of a "Merry Gang" (as Andrew Marvell called them) of aristocrats and playwrights. frequent ebriety [sic], as in no interval to be master of himself. John Wilmot is currently considered a "single author." If one or more works are by a distinct, homonymous authors, go ahead and split the author. John Wilmot is composed of 18 names. You can examine and separate out names.